PARIS --- Three years after initial ground trials began in Italy, a Eurofighter Typhoon trials aircraft has carried out its first live firing of a Storm Shadow cruise missile. This statement finally ends six months of obfuscation during which the companies involved in the Storm Shadow integration program declined to clarify contradictions and inconsistencies in their public statements and to provide specific information, suggesting that they were hiding technical problems. Even now, the fact that the first firing took place on June 14, and whether it was carried out by Instrumented Production Aircraft (IPA) 2 (belonging to Leonardo Aircraft Division) or IPA6 (owned by BAE Systems) at the UK Ministry of Defence’s test range in the Hebrides, could not be officially confirmed. The information blackout was all the more unexpected that the Storm Shadow missile is considered a “major Eurofighter capability component” by the UK Ministry of Defence, and also is a major competitive advantage on the export market, where all of Eurofighter’s competitors, including Rafale (Storm Shadow) and Gripen (Taurus KEPD), are armed with long-range cruise missiles. The first Storm Shadow live firing will reassure customers that, 30 months after the first Storm Shadow integration trials on Eurofighter began in December 2013, the program is now making noticeable progress. However, no imagery has yet been released of the several jettisoning trials of Storm Shadow, which we have repeatedly requested since these trials were announced in November 2015. 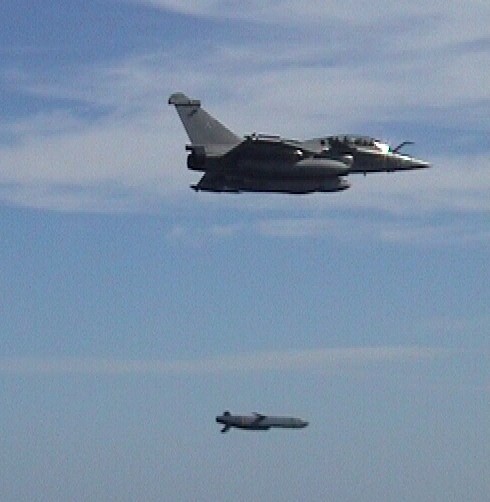 A picture of the first firing of a Scalp-EG, the French variant of Storm Shadow, in July 2004 released at the time by the French ministry of defense. On July 6, the position changed again. “As regards the still/video images of the firing, as this activity happened very recently these, as mentioned in my last email, are understandably in the clearance process and we hope to be able to share these with you shortly,” Squires said in an e-mail message. This retention of imagery, which will now hopefully end “shortly,” stands in stark contrast to the same companies’ past eagerness to communicate widely that the Storm Shadow integration program is progressing well. Since August 4, 2014, a total of 13 press releases have been issued about Storm Shadow’s integration on Typhoon – on average, one every two months -- and several more have referred to it. Progress is hard to measure, however, as some of these releases have repeated “achievements” that had already been announced. and again a year later, on Nov. 9, 2015, by BAE Systems (“First Storm Shadow Missile Successfully Released From A Eurofighter Typhoon”). At the time, both companies declined to say whether this meant the initial “first” attempt had failed, and required a second. They also did not say why the same trial was run a second time, 11 months later. The use of vague terminology and write-arounds (“release,” “operational release,” “missile release tests,” “store release trials,” “functional test,” “inert drop-tests,” “jettison trials,” “jettisoned,” “avionics releases”) to describe the same operation -- dropping a missile without firing its engine -- encourages misunderstandings. Taken together, the lack of precise answers, the imagery blackout and the terminology used by the program clearly suggest the subject is a sensitive one that the companies involved are reluctant to be candid about. 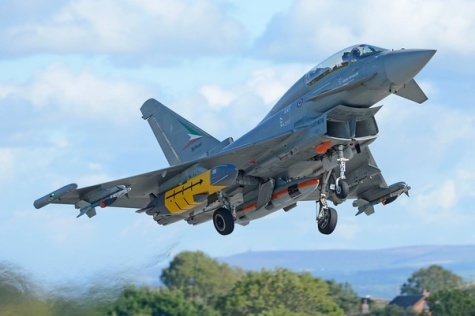 According to a June 29 press release by BAE Systems, Typhoon will fly at the RIAT and Farnborough air shows this week-end and next week with all of its P2E and P3E future weapons -- except Storm Shadow, which was not even pictured on the accompanying computer-generated image. It will be interesting to see if – and what -- information is released during the Farnborough air show next week, where Eurofighter has scheduled a July 13 “capability briefing with all the details,” according to one industry executive.